This is a product that makes any implant placement very reliable. In the past, general dentists would refer the patient to a surgeon or a specialist to place an implant. Now, with a little training and this guide, any dentist can place an implant safely. Once a digital impression has been taken, it is sent off to the lab. I use a 3Shape TRIOS scanner and it works perfectly well with the DIOnavi system. Ten days later, a customised plan with a digital implant guide arrives. A number of different options are included and you can choose whether to create a custom temporary crown or just place a suitable healing abutment which has been scanned at the same time. The guide is reliable and the implant surgery is minimally invasive and quick to complete. The procedure is comfortable for the patient and afterwards, there is less pain, less swelling and perfect results. This type of implant surgery doesn’t require stitches and that’s a saving in cost and pain for the patient. 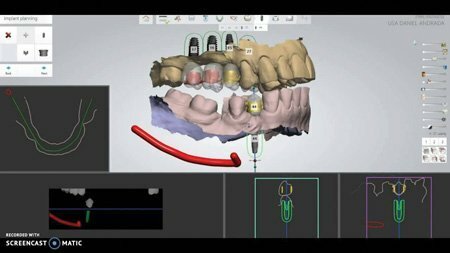 The entire dental industry is moving towards digital solutions and this system works extremely well. It’s fast, efficient and I spend less money on consumables. It’s really an exceptional product. The reps are working extremely hard to get their consumers up to speed with this new system and they constantly run training seminars for dentists. Like all new products, it has a learning curve but it doesn’t take too long to develop consistent results with this system. The company could also use better marketing as not many dentists seem to know about this excellent product.